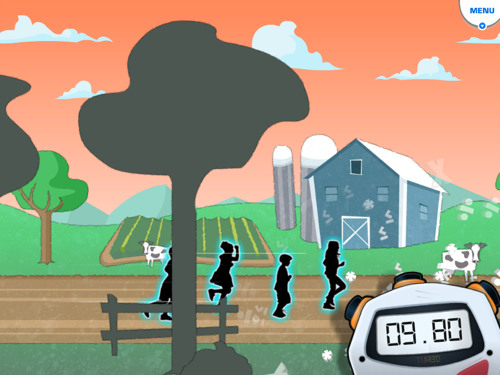 Run a virtual 26.2 mile marathon over time and practice dedication, goal setting, and math fluency in one big stride! 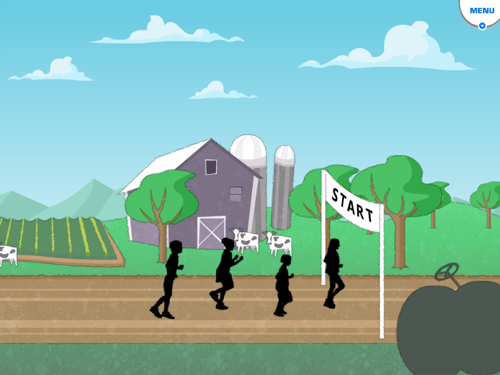 In each session, your class gets a little closer to the finish line -- and by answering grade-appropriate math fluency questions (based on Common Core standards), you’ll sprint towards your best time. In Mega Math Marathon, students jog and sprint alongside their desks as they run a virtual 26.2 mile marathon. As students run, we’ll present grade-appropriate math fluency questions according to the categories you select. Students should answer aloud (in unison or on your prompt) and the teacher indicates if the question is correct or incorrect. When the class gets three questions correct, they earn a 15 second Turbo Run -- helping them get a better time in their marathon. Mega Math Marathon is a GoNoodle Plus game and is only available if you have access to GoNoodle Plus! Learn more about GoNoodle Plus in About Plus support article. Practice math fluency in a fun setting. Teach dedication, persistence, and goal setting. Use vigorous activity to engage your classroom. During your daily math lesson! Before a math test to warm up the brain. Note: Mega Math Marathon does not work on mobile devices or tablets at this time. This activity can only be played when using a desktop or laptop computer. The ability to recall basic math facts fluently is necessary for students to attain higher-order math skills. Rapid math-fact retrieval is a strong predictor of performance on math achievement tests. Distance running is all about persistence and dedication -- skills that help kids become more resilient. Practice taking bite-sized progress toward a big goal. Choose the grade level you’ll play in this session. Choose the math category you’ll play in this session. Choose the math subcategory you’ll play in this session. You can choose one or more. Choose your session length, and have students run in place together! When a question appears on the screen, have students (or a single student) call the answer out loud. If the answer is correct, press UP on the keyboard. If the answer is incorrect, press DOWN on the keyboard. When the session is over, review your progress in the marathon! Mega Math Marathon is designed to help students maintain and improve math fluency skills. GoNoodle worked with core subject experts to encourage mental practice with fluency skills -- skills that a teacher expects students to have mastered prior to entering their classroom, as well as those the teacher is developing in current instruction. These math fluency skills are paced based on Common Core standards by grade level. Mega Math Marathon includes more than 5500 math questions! Using a few minutes of active fluency practice during the day will not only reinvigorate the students to focus better, but will provide the basis of automaticity that will help students solve problems quickly and confidently -- allowing them to progress deeply into their conceptual understandings. In fact, a 2015 study conduced by SEG Measurement found that students who played Mega Math Marathon at school showed a 50% increase in math scores over those students who did not play the game. When you open Mega Math Marathon, you will select four settings that will configure the content that appears in this session. Choose a grade level for the math. Grade levels available are K through 5. Note that the grade you select determines the options available to you in the next steps. Select the duration of the play session. You can play for 2, 3, 4, or 5 minutes. Note: For a full list of Categories and Sub-categories by grade, see the Math Category Matrix section of this document below. After you select these options, you’ll see a brief loading screen while the game loads your questions. The game will begin. Students should being jogging in place along with the characters they see on screen. After your students have started jogging, Mega Math Marathon will present a math question. You may choose to read the question aloud, or let students read the question. The class will then answer. Before playing, you should set an expectation with your class about how answering will be managed inside your class: you may wish to ask students to answer in unison, or you may elect to select a student to answer. You, the teacher, then indicate to the game if the class answered the question correctly or incorrectly. Press UP on the keyboard if the answer was correct. Press DOWN on the keyboard if the answer was incorrect. Note: The game allows 20 seconds to answer the question. If no answer is provided within 20 seconds, the game will automatically present a new question. If you indicated that the class answered correctly, they’ll hear appropriate feedback and see the correct answer on the screen. A new question will then appear. If you indicated that the class answered incorrectly, the game will hear feedback and see the correct answer. Shortly after, a new question will automatically appear. When the class has answered three questions correctly, they will unlock a Turbo Run. The screen will change and a stopwatch will appear. Students should sprint in place for 15 seconds! Mega Math Marathon will continue to present new questions using this logic for the duration you selected during setup. Once that duration has passed, the game will end as soon as possible, without interrupting a question or Turbo Run. 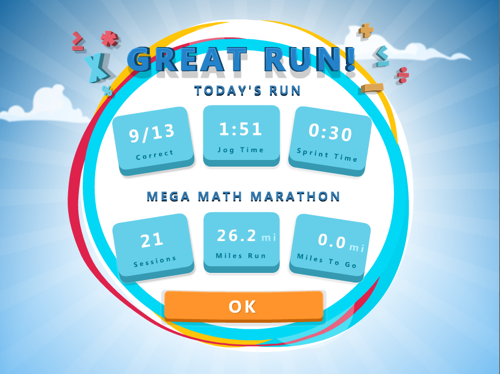 Mega Math Marathon will present a summary of your run and your progress in the marathon. Click OK to save your session; the game then returns you to the main menu. If you want to delete your progress in Mega Math Marathon and start over, click Reset on the main screen of the game. A message will ask you to confirm your decision. If you’re in fullscreen mode, press the ESC key on your keyboard or click the Exit Fullscreen button under the settings menu in the top right. Then click Close to go back to GoNoodle. How should students answer the questions in Mega Math Marathon? You, the teacher, indicate in the game if the student(s) answered the question correctly or incorrectly. You may ask your students to shout the answer in unison, or call on students one at a time to answer. For Congruent/Similar: press UP for similar, press DOWN for congruent. Note: Mega Math Marathon allows 20 seconds to answer the question. If no answer is provided within 20 seconds, the game will automatically present a new question. How is distance calculated in Mega Math Marathon? The class travels roughly 10.3 MPH during jogging. The class travels roughly 17.2 MPH during sprinting. On average, Mega Math Marathon should be completed in around 50 gameplay sessions. Your results depend on how quickly students answer questions!